This raised the belief that the word "organic" on a wine label would turn off some consumers because of their association with poorly made, no-sulfite-added "organic wines." But Wallo said that "made from organic grapes" on his label opens some doors for him to retail stores that wouldn't be open otherwise. "We just had our best year ever, and the organic label was a big part of it," Wallo said. Robinson said the absence of "organic" and "biodynamic" on wine labels is because Mendocino is, you know, laid back. "Look around the room. Who do you see as a sophisticated marketer?" Robinson said, and his point was well-taken: Fetzer and Bonterra (owned by Concha y Toro) and Paul Dolan Vineyards (a Fetzer alum) were about the only sophisticated-looking booths. "Most of these people are doing it because they're the salt of the Earth. They're not doing it for political reasons." Bonterra is still made from organic grapes, but Fetzer is now "The Earth Friendly Winery" (TM). I don't know what that means, but I know Fetzer wines are no longer made from organic or biodynamic grapes. Claims like this that aren't rigorously certified are part of the problem with green marketing of wine. "If I went through every winery in Napa and Sonoma, every one would claim to be sustainable in some way," Wallo said. "What does it mean if everybody can say it? 'Natural' is like that too. What does that mean?" 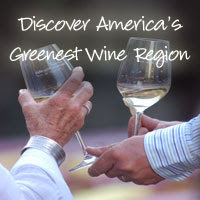 I suggest to Mendocino County vintners that you have a problem, claiming greenness as a group without your individual members providing proof of it. I don't have a solution. I'm not sure yet another type of certification is the answer. Lodi Rules is a good program, but how many consumers know that it exists, or that it's significantly more stringent than other regional certification programs? The best solution would be simply for Mendocino County wineries to make more certified biodynamic and organic wines. But this is Mendocino County, a stronghold of free spirits where pot growers and militia types live on adjoining properties with their own generators fueled by biodiesel. "I don't want to tell people what to do and I don't want them to tell me what to do," Wallo said. 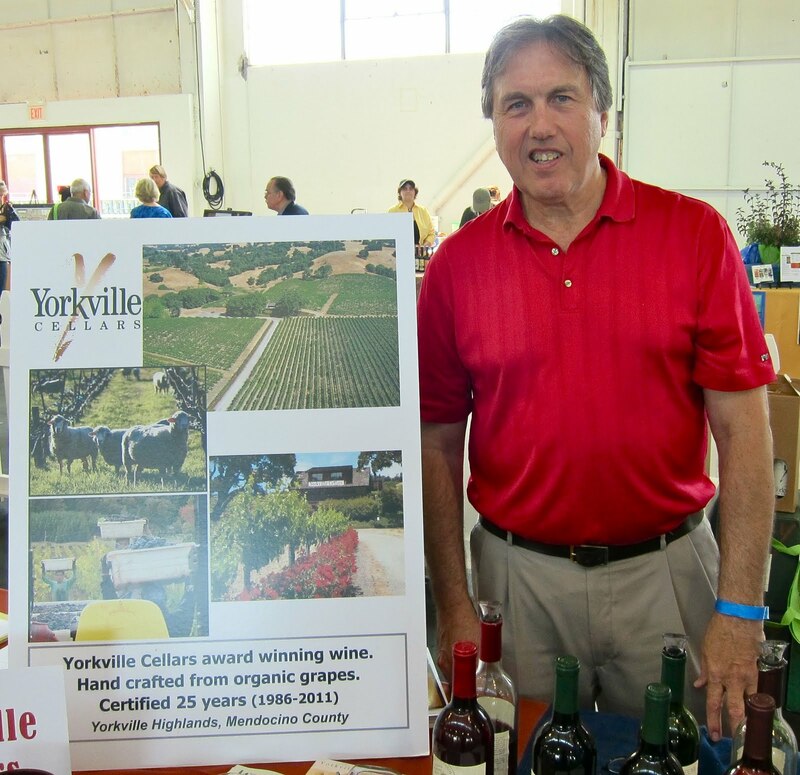 Yorkville Cellars is one of the few wineries anywhere in the world to make varietal wines from all 6 Bordeaux red grapes, as well as a blend. "We're Mendocino County's answer to Cain Five," Wallo said. He didn't pour all 6, unfortunately, but I did like his Yorkville Cellars Rennie Vineyard Yorkville Highlands Petit Verdot 2008 ($28): Bright cherry fruit with a ton of tannin; somewhat one-dimensional but pleasant, and just 13.5% alcohol. 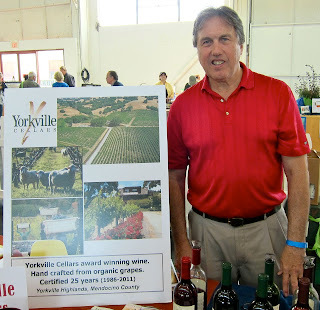 I really enjoyed the Yorkville Cellars Randle Hill Vineyard Yorkville Highlands Sauvignon Blanc 2010 ($18): a very fresh wine with stonefruit and citrus flavors that round out on the finish. He also makes a lively rosé from Cabernet Franc: light but feisty, with nice cherry fruit and a slight herbal note. I asked Wallo how he keeps the alcohol down and he said, "We're up at 1000 to 1300 feet. We're near the Sonoma County border. We get more of a breeze in the afternoon. We're 10% less hot than Alexander Valley." Take that, Anderson Valley. That should be, "from all 6 Bordeaux red varieties." I know, you get what you pay for. I just can't help myself. For those of you who are maybe wondering, the sixth Bordeaux variety is Carmenere - allowed but no longer grown in Bordeaux to my knowledge. Just a badly written sentence. Editing from The Cloud. I suspect the Mendocino County "green" claim is still based on having the highest percentage of its grapes (by acreage) certified organic (versus other California Counties). Although I haven't been tracking that data for the past few years. A majority of Mendocino County's grapes, unfortunately, still leave the County for more general appellations (California bottlings). I do agree with Zac Robinson that labeling "organic" isn't necessarily a marketing plus. While being "green" is perceived as a positive, being "organic" is not always a positive with wine buyers (mostly trade, I think), who still tend to imagine some strange "special wine" ghetto for Organically Grown.